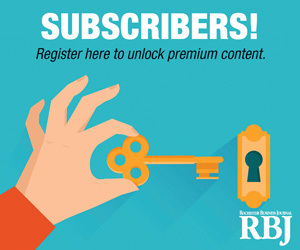 The Rochester Business Journal welcomes press releases. Notices of calendar events should be submitted three weeks before the event date to ensure timely publication. Send digital submissions to vspicer@rbj.net. Brighton’s Best Chapter of Business Network International Meeting-Free-7 – 8:30 a.m.-Jewish Community Center, 1200 Edgewood Ave.-Also offered April 8-Call Stephen Papuzek at 802-4956 for additional information. Mid Day Masters Chapter of Business Network International Meeting-Free-Noon – 1:30 p.m.-Bagel Bin Cafe, 2600 Elmwood Ave.-Also offered April 8-Call Elizabeth Randisi at 248-3800 for additional information. Rochester Area Business Ethics Foundation Seminar-"Finding the Ethical Edge"-$195-8 a.m. – 4:30 p.m.-Nazareth College of Rochester, 4245 East Ave.-Call 383-1060 to register. RochesterWorks Job Network Meeting-Free-9 – 11 a.m. and 1 – 3 p.m.-255 N. Goodman St.-Also offered April 6-Call 258-3500 for additional information. Finger Lakes Works-Ontario Career Club-Free-9 – 11 a.m.-3010 County Complex Drive, Canandaigua-Also offered April 11-Call Cathy Levickas at 396-4020 for additional information. Networking Referral Group of Rochester Meeting-Free-7:15 – 8:30 a.m.-255 Woodcliff Drive, Fairport-Also offered April 12-Call 248-6718 for additional information. Early Edition Business Professionals Networking Group Meeting-Free-7:30 a.m.-Bagel Bin Cafe, 2600 Elmwood Ave.-Also offered April 12-Call 292-1220, ext. 312, for additional information. Success Unlimited Chapter of Business Network International Meeting-Free-Noon – 1:30 p.m.-Browncroft Restaurant, 2501 Browncroft Blvd.-Also offered April 12-Call Natasha Johnson at 329-5566 for additional information. Speechcrafters Toastmasters Club Meeting-Free-6 p.m.-T.C. Riley’s Irish Pub, Park Point, Rochester Institute of Technology-Also offered April 19-Call Kevin Yost at 334-7179 for additional information. Rochester Business Alliance Inc. Course-"Microsoft Word 2007 Introduction"-$149-8:15 – 11:15 a.m.-Accent Training, 2352 Lyell Ave.-Second session offered April 7-Call 256-4616 for additional information. Rochester Business Alliance Inc. Course-"Social Media Roller Coaster"-$125 for members, $165 for non-members-8:30 a.m. – Noon-150 State St.-Call 256-4616 for additional information. Rochester Business Alliance Inc. Course-"GO System – Getting Organized"-$169 for members, $199 for non-members-8:30 a.m. – 12:30 p.m.-150 State St.-Call 256-4616 for additional information. Rochester Section of the American Chemical Society Networking Mixer-Free-5 – 8 p.m.-MacGregors’ Grill & Tap Room, 300 Jefferson Road-Call Henry Gysling at 295-1510, ext. 224, for additional information. Teaching & Training by Design LLC Theatre-Based Training-"Diversity & Inclusion: Leading with a Wider Lens"-$199-8:30 a.m. – 4 p.m.-Temple B’rith Kodesh, 2131 Elmwood Ave.-Call 388-5108 to register. The August Group Networking Meeting-Free-9:30 – 11 a.m.-Bagel Bin Cafe, 2600 Elmwood Ave.-Visitors are welcome-Also offered April 7-Call Tracey Aiello at 259-0610 for additional information. Premier Professionals Chapter of Business Network International Meeting-Free-7 – 8:30 a.m.-Flour City Diner, 2500 East Ave.-Visitors are welcome-Also offered April 13-Call (518) 618-1260 for additional information. The New York Networkers Chapter of Business Network International Meeting-Free-11:30 a.m. – 1 p.m.-Flour City Diner, 2500 East Ave.-Visitors are welcome-Also offered April 13-Call Adam Wood at 720-9870 for additional information. North East Marketers Chapter of Business Network International Meeting-Free-7 – 8:30 a.m.-Midtown Athletic Club, 200 E. Highland Drive-Also offered April 13-Call Mark Dolan at 218-4574 for additional information. TNT Chapter of Business Network International Meeting-Free-7 – 8:30 a.m.-Best Western, 7449 Route 96, Victor-Also offered April 13-Call Donald Cheney at 919-6210 for additional information. Early Birds Chapter of Business Network International Meeting-Free-7 – 8:30 a.m.-Jewish Community Center, 1200 Edgewood Ave.-Also offered April 13-Call David McClellen at 503-8598 for additional information. Redeye Referrals Chapter of Business Network International Meeting-Free-7 – 8:30 a.m.-Olympia Family Restaurant, 2380 Lyell Ave.-Also offered April 13-Call Nick Castro-nova at 749-8360 for additional information. Canalside Trailblazers Networking Group, CTN II-Free-7:15 – 8:30 a.m.-Locust Hill Country Club, 2000 Jefferson Road-Also offered April 13-Call Ronald Axelrod at 203-1020 for additional information. Rochester Business Network Meeting-Free-7:30 – 8:30 a.m.-Brighton Town Hall, 2300 Elmwood Ave.-Also offered April 20-Call Doug Drake at 368-2108 for additional information. Canalside Trailblazers CTN IV Meeting-Free-7 – 8:30 a.m.-Jay’s Diner, 2612 West Henrietta Road-Also offered April 27-Call John Guglielmo at 232-2270, ext. 4550, for additional information. Toastmasters International Impressionist Club Meeting-Free-7 – 9 p.m.-Legacy Parklands, 2000 Park Creek Lane, Churchville-Visitors are welcome-Also offered April 20-Call Marlene Markham at 889-4481 for additional information. Canandaigua Community Toastmasters Club Meeting-Free-4:15 – 5:15 p.m.-Canandaigua VA Medical Center, 400 Fort Hill Ave., Canandaigua-Also offered April 20-Call Brenda Pulver at 393-7216 for additional information. Flower City Chapter, International Association of Administrative Professionals Dinner Meeting-$25 for members, $27 for non-members-5:15 p.m.-Airport Marriott, 1890 W. Ridge Road-Also offered May 4-Call Tarie Vinci at 678-3225 for additional information. Rochester Business Alliance Inc. Course-"Performance Management"-$195 for members, $265 for non-members-8:30 a.m. – 4:30 p.m.-150 State St.-Call 256-4616 for additional information. Rochester Business Alliance Inc. Course-"Microsoft Access 2007 Introduction"-$149-8:15 – 11:15 a.m.-Accent Training, 2352 Lyell Ave.-Second session offered April 8-Call 256-4616 for additional information. Rochester Business Alliance Inc. Course-"Yellow Pages Advertising: The Real Facts"-$150 for members, $190 for non-members-8 a.m. – 1 p.m.-150 State St.-Call 256-4616 for additional information. Rochester Women’s Network Meeting-"Overcome Your Immunity to Change: A Pathway to Business & Personal Improvement"-Presenter: Sally Ward-$15 for members, $25 for non-members-Cornell Co-operative Extension, 249 Highland Ave.-Call 271-4182 for additional information. Notable Networkers Chapter of Business Network International Meeting-Free-7 – 8:30 a.m.-Holiday Inn Express, 860 Holt Road, Webster-Visitors are welcome-Also offered April 14-Call (518) 618-1260 for additional information. Networks Lead Group Meeting-Free-8 a.m.-Golden Fox Restaurant, 1115 Culver Road-Visitors are welcome-Also offered April 14-Call 254-8710 for additional information. Greece A Team Chapter of Business Network International Meeting-Free-7- 8:30 a.m.-Hampton Inn, 500 Center Place Drive-Visitors are welcome-Also offered April 14-Call Carolyn Stiffler at 732-0428 for additional information. Towpath Referrals Chapter of Business Network International Meeting-Free-7 – 8:30 a.m.-Pineview Family Restaurant, 2139 Union St., Spencerport-Also offered April 14-Call Chris Smith at 899-2675 for additional information. Business Builders Chapter of Business Network International Meeting-Free-7 – 8:30 a.m.-Bayfront Restaurant, 1075 Empire Blvd., Irondequoit-Visitors are welcome-Also offered April 14-Call David Cook at 872-2050 for additional information. Rochester Business Connections Lead Group Meeting-Free-8 a.m.-Jay’s Diner, 2612 West Henrietta Road-Visitors are welcome-Also offered April 14-Call Bill Sweetland at 349-0336 for additional information. Canaltown Connections Networking Group Meeting-Free-7 – 8:30 a.m.-Slayton Place Restaurant, 54 Slayton Ave., Spencerport-Visitors are welcome-Also offered April 14-Call 880-8156 for additional information. Canalside Trailblazers Networking Group, CTN I-Free-7 – 8:30 a.m.-Midvale Country Club, 2387 Baird Road, Penfield-Also offered April 14-Call 598-6220 for additional information. Canalside Trailblazers Networking Group, CTN III-Free-7 – 8:30 a.m.-Greece Chamber of Commerce, 2496 W. Ridge Road-Also offered April 14-Call 598-6220 for additional information. Rapid Referrals Chapter of Business Network International Meeting-Free-Noon – 1:30 p.m.-Flour City Diner, 2500 East Ave.-Visitors are welcome-Also offered April 14-Call Andrew Kernahan at 319-1751 for additional information. East Rochester All Stars Networking Referral Group Meeting-Free-8:30 – 9:30 a.m.-Lemoncello Cafe, 137 W. Commercial St., East Rochester-Also offered April 14-Call Jenalee Herb at 704-7839 for additional information. Rochester Business Alliance Inc. Course-"Business Writing and Emails"-$390 for members, $530 for non-members-8:30 a.m. – 12:30 p.m.-150 State St.-Four-session series-Call 256-4616 for additional information. Rochester-Genesee Regional Transportation Authority Governance Committee Meeting-Free-10 – 11:30 a.m.-Monroe Community College, 1000 East Henrietta Road-Call 654-0273 for additional information. Rochester-Genesee Regional Transportation Authority Regular Board Meeting-Free-Noon – 1:30 p.m.-Monroe Community College, 1000 East Henrietta Road-Call 654-0273 for additional information. Toastitarians Toastmasters Club Meeting-Free-12:45 – 3 p.m.-First Unitarian Church of Rochester, 220 S. Winton Road, Youth Room-Also offered April 17-Call Shirley at 482-6640 for additional information. Toasted Sage Toastmasters Club Meeting-Free-Noon – 1 p.m.-Toshiba Business Solutions, 150 Metro Park-Visitors are welcome-Also offered April 26-Call Jeff Fasoldt at 697-5512 for additional information. Professionally Speaking Toastmasters Meeting-Free for non-members-6:30 – 9 p.m.-Midvale Country Club, 2387 Baird Road, Penfield-Also offered April 26-Call 733-0164 for additional information. Rochester Downtown Development Corp. Panel Discussion-"Voice of the Next Generation"-$45 for members, $50 for non-members-11:45 a.m. – 1:30 p.m.-Radisson Hotel Rochester Riverside, 120 E. Main St.-Call 546-6920 for additional information. Postprandial Toastmasters Meeting-$20-6:30 – 9:30 p.m.-Sanibel Cottage, 1517 Empire Blvd., Webster-Also offered April 27-Call Drew Martin at 329-3476 for additional information. International Business Council Seminar-"Benefits of Foreign Trade Zones"-Free-8:30 – 10:30 a.m.-Orleans County IDA, 121 N. Main St., Albion-Call 530-6204 for additional information. 4/1/11 (c) 2011 Rochester Business Journal. To obtain permission to reprint this article, call 585-546-8303 or e-mail rbj@rbj.net.